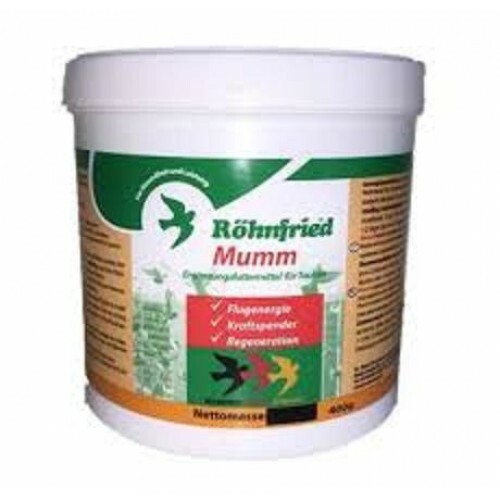 Mumm 400 gr by Rohnfried is a high quality energy tonic for racing pigeons. - Provides a dove and glycogen energy reserves. - Contains maltodextrin and fructose, the combination provides power fast and durable for the body. IMPORTANT: After the arrival, for a speedy recovery, manage Mumm for 1-2 days. - Manage Mumm sports throughout the season, 2-3 days before the flight muscles to provide energy reserves. the dose to be administered will be 2 steps = 10 gr per liter of drinking water.